The Pamunkey, as a tribe, are neither handsome nor homely, long nor short, stout nor slim, in fact they differ among themselves in these respects to the same degree found among the members of a white community of the same size. They are not particularly strong and robust, and their average longevity is lower than that of their neighbors. These facts are perhaps in a measure attriutable to the frequent marriages between near relatives. We, the last descendants of the Powhatan tribe of Indians, now situated on a small reservation on the Pamunkey river, 24 miles from Richmond, Va., and one mile east of the historic White House, where Gen. George Washington was married to his lovely bride in the St. Peter’s Church. We are now known as the Pamunkey tribe of Indians, following the customs of our forefathers, hunting and fishing, partly with our dugout canoes. 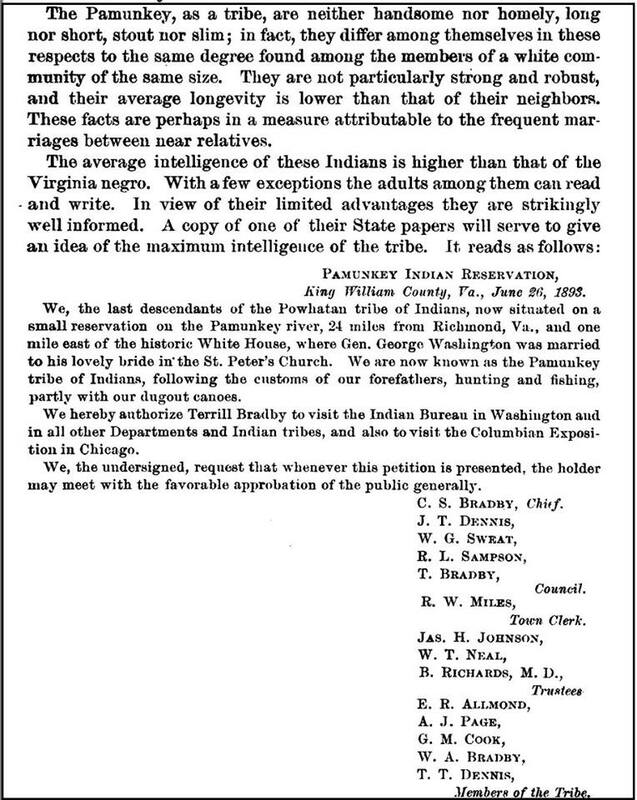 We hereby authorize Terrill Bradby to visit the Indian Bureau in Washington and in all other Department and Indian tribes, and also fo visit the Columbian Exposition in Chicago. We the undersigned, request that whenever this petition is presented, the holder may meet with the favorable approbation of the public generally. Hat tip to Jennifer Martin for this information. I see from your recent posts that you mentioned article I wrote for the North Carolina Genealogical Society Journal about James Logan Colbert of the Chickasaw. My 5th GG Joseph Calvert/Colbert was his father. They lived on Plumtree Island in North Carolina on the Roanoke River with other Indian trader families: Colson, Turbeville, and Long. Abraham Colson, a registered Chickasaw trader for the British, was my 5th GG Joseph’s partner.